Many European countries haven't recovered yet from the financial crisis of 2007-2008 like Italy, Portugal, Spain, Greece. Lots of uncertainty for a Brexit Deal. UK parliament still has not approved Theresa May proposal and a NO Deal seems closer than ever. European Banks for the past three quarters have reported negative numbers , like Deutsche Bank, and the ECB has kept interest rate at minimum without obtaining the expected results. Most investors are currently keeping their focus on the trade deal between China and the United States, but something else needs some attention at the moment, something that comes from overseas. The European Union is on the verge of a series of events that could impact the financial markets in the near future. In this article I will provide my own analysis on three major factors that could have a big impact for the European markets and International markets. Most specifically, I will start by giving an update on the current situation of the Eurozone , than I will underline the most recent news on Brexit , and lastly I will shift my attention on two major topics: Governments debts and the wave of populism across the European Union. I will than conclude my article by giving out my personal suggestion for the European Union's future outlook. 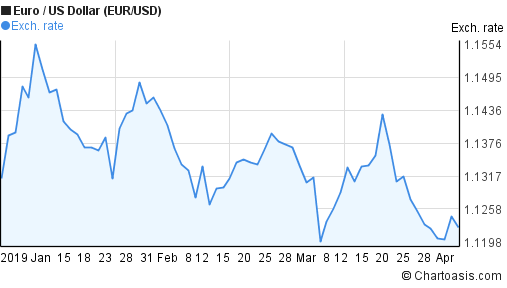 As of April 5th 2019, the exchange rate between the Euro and the US dollar is 1.1215. The single currency has declined steadily since the U.S. Federal Reserve’s meeting in March. The sentiment reports from IG Markets, which is a UK-based company providing trading in financial derivatives such as contracts for difference and financial spread betting, strongly suggest that the euro is likely to move lower with a target around the 1.11800 area (FXWirePro). After the Global Financial Crisis of the 2007-2008, the ECB started to lower interest rates in order to stimulate the economy of the European countries, and lowered the interest rate all the way to zero on March 2016. During the latest meeting on march 2019, the ECB confirmed that they will proceed in being cautious for the near future driven by the uncertainty of the global markets, most specifically the ECB pointed out that the events surrounding Brexit and the trade deal between China and the United States, could affect the financial markets soon, and they do not see a potential increase in the interest rate before the end of 2019. Moreover, as we are approaching an important meeting for the EU which will be held on April 10th, the ECB officials agreed that interest rates should remain at current levels until the end of 2019, with some debate about shifting the forward guidance to March 2020 instead, on the back of weaker than expected economic data, uncertainties related to geopolitical factors, the threat of protectionism and vulnerabilities in emerging markets, minutes of the March meeting showed. Policymakers also concurred that the launch a new series of quarterly TLTRO would preserve favorable bank lending conditions and the smooth transmission of monetary policy (Trading Economics). As the ECB kept the interest rate at this unprecedented low level for an extended period of time, the Euro started to become weaker and weaker, which led many investors to diverge from the European Union and move their resources towards the US, which ultimately led the US dollar to rally. In the previous paragraph I underlined the current situation of the Eurozone, first I analyzed the EUR/USD exchange and than I shifted my focus on the current interest level for the EU and the outlook given by the ECB for the near future. In this paragraph instead, I will dive deeply in some factors that could have a big impact in the financial markets in the upcoming months, I will mostly underline some data from the European Union balance sheet, and from there I will deduct my constructive analysis. As shown by the Unemployment rate graph above, the European Union has been able to lower the level of unemployment throughout the region in the last few years, and currently the unemployment level stands at 6.8%. I personally consider this number to be heavily inflated considering that only Germany has a lower unemployment rate than the European Union' average, whereas the majority of the other members have a higher unemployment rate, and some of them (Italy) have reported higher unemployment rate than previous quarter for the first time since 2016. The financial crisis of 2007-2008 had a serious impact on many European countries, some of them have reverted in their own financial crisis (Greece), and others have never really recovered (Italy). When I build my own research based on economic trends, I tend to rely my analysis more on the youth unemployment data than the national unemployment data. The reason behind this is that youth unemployment gives me more insights on the real health of an economy. 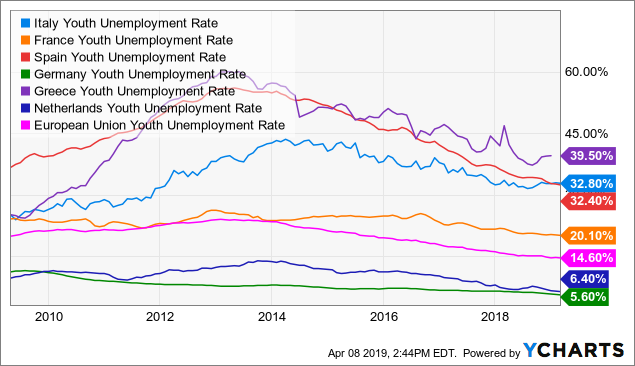 An economy that has relative low youth unemployment rate usually tells me that it's easier for a firm in that country to replace workers and to expand. An economy like Greece, Italy, Spain, where the youth unemployment rate can be as high as 30% or more, usually tells me that firms in those countries are not able to expand and it's harder for them to keep pace with firms of other countries with a lower youth unemployment rate who can hire younger labor that can learn on the job much quicker than their older colleagues, which could eventually result in faster service and better job outcome. A key component for GDP growth is innovation. A country that is able to keep up with global trends, and overall changes in the global markets, usually tends to do better than countries that are not able to adapt themselves to new trends. In this sense, youth unemployment is directly correlated with innovation. Since the late 90's the European Union has tried to find a solution for this problem. In 2016 the EU, along the International Labour Organization (ILO), introduced a program that guarantees people between the age of 18-25 a guaranteed job for at least six month with the option for a full time employment at the end of the six months, and if recent college graduates, an apprenticeship within four months from the graduation date. There is still a long way to go, but results seem optimistic in certain area. 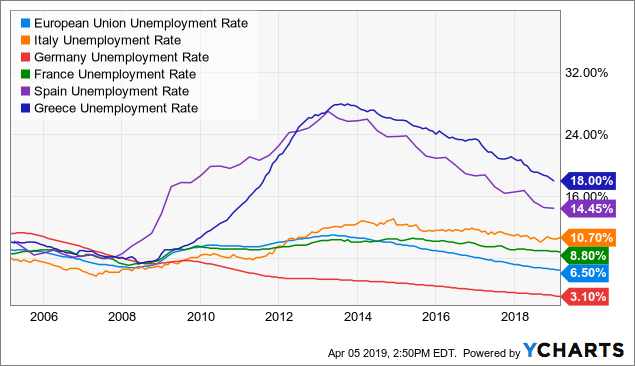 After analyzing unemployment rate for the EU, I will than switch my analysis to a more global view by analyzing certain data than are showing some worrisome signs for the near future. Italy's economy shrank 0.1 percent on quarter in the last three months of 2018, the same as in the previous period and slightly above the 0.2 percent contraction previously estimated. Still, it was the second straight quarter of GDP decline, throwing the country into recession for the third time in a decade. GDP Growth Rate in Italy averaged 0.59 percent from 1960 until 2018, reaching an all time high of 6 percent in the first quarter of 1970 and a record low of -2.70 percent in the first quarter of 2009. As far as future projections, many analyst are expecting great numbers for Italy in the upcoming quarter release. Initially, at the end of 2018 the Italian government predicted a 1% growth for their economy in 2019, the number retraced to 0.6% in January, and many now are forecasting only a 0.1% potential GDP growth. But it is not just Italy who is slowing down, many countries all over Europe are starting to contract. For example, the German economy stagnated in the fourth quarter of 2018 after a 0.2 percent contraction in the July-September period, which was the first time GDP shrank since 2015 (Trading Economics).GDP Growth Rate in Germany is expected to be 0.10 percent by the end of this quarter, according to Trading Economics global macro models and analysts expectations. Looking forward, the estimated GDP growth rate for Germany stands at 0.40 in 12 months time. Overall the GDP Growth Rate in Euro Area is expected to be 0.10 percent by the end of this quarter, according to Trading Economics global macro models and analysts expectations (trading economics). As analysts are becoming more cautious with the next economic estimates for the EU region, many investors are getting more nervous for a particular data that is affecting the EU in particular, which is the government debt for GDP. Overall the EU government debt for GDP stands at 80%, which is actually lower than many other strong economies ( The US for example stands at 109%), but there a few countries that currently have an outrageous high ratio between debt and GDP. Greece, Italy, Portugal, have respectively the second, the fourth and sixth highest debt to GDP ratio in the world. Many credit rating agencies have recently downgraded the ability for Greece, Italy, Portugal to repay their debts. A credit rating is used by sovereign wealth funds, pension funds and other investors to gauge the credit worthiness of Portugal thus having a big impact on the country's borrowing costs. Using the Standard & Poor rating metrics, where AAA is the maximum allowed score, Greece currently has a B+ rating , Portugal has a BBB rating and Italy has a BBB rating ( with negative outlook). If we put that into perspective, BBB- is the lowest rating an investor would consider for buying those long term bonds, which explains why many are paying close attention to those three countries inside the European Union, since if one of them declares a major default it could affect the entire region exponentially, most specifically Italy who has the 9th highest GDP in the world. Other major European banks, like $UBS are not having a better performance. All of them and many other banks have reported negative results for the last three quarters. 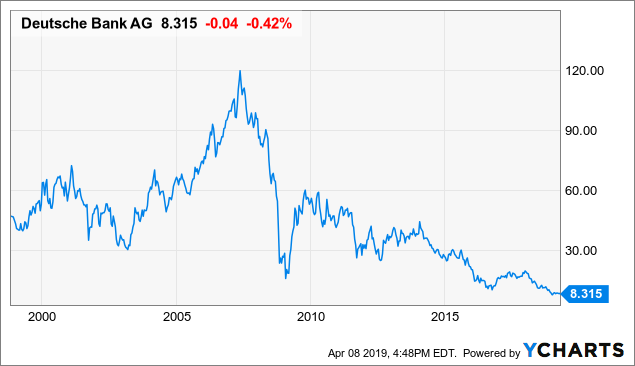 And many other banks like Banca Monte Paschi di Siena have been in serious stress for years now to the point that many investors were worried about a potential debacle. On the other hand the ECB said before that they will not look to raise interest rates during the 2019 year, and this could put more stress to the European banks who are underperforming any other sector in Europe. As we are in the stall phase, the potential Brexit is already impacting many sectors of the UK's economy. Today Jaguar Land Rover has begun its week-long factory shutdown as part of its plans for Brexit, on the day the company posted lower sales in Europe and China. Overall many are predicting a huge defeat for the UK if Brexit was to occur. In addiction to the pound's devaluation, analysts are predicting a big decrease in GDP per capita and an increase in the cost of living expenses such as food, and services. Brexit will also affect Europe and the financial markets for a few reasons. Brexit will certainly add uncertainty to the financial markets, which could bring more volatility and stress for investors, which means investors will eventually pull out their money from the market waiting for a calmer period, and this could shrink trading profits. Banks are already starting to relocating to other European major cities like Frankfurt. This movement takes time and could have higher costs than expected in the near future because some functions could end up being duplicated in London and in the EU, which would reduce savings. Investment banks could see their profit reduced because of uncertainty created by Brexit. Everything depends also on how the UK parliament will decide to leave, in the case of a NO Brexit deal everything i just mentioned could have even a bigger impact. Throughout the Article I focused most of my analysis towards economic data and financial markets. There is something else that is currently impacting the European Region: The Populist Wave. The next elections for the European Parliament will be held between May 23rd and May 26th 2019.The result of this election could give us a really important sign of were the European Union is heading. Many far right movements have found relative success in the last couple years, thanks to issues like national security, immigration. The most notable name is the leader of the Italian Party "The League", Matteo Salvini. In fact he is the name than many are watching with close attention. Salvini has really strong and far right values like border control, anti-euro, national security, immigration policy, whom many consider the true leader of this new wave. Recently he also stated that the Italian banks should not have access to gold, but citizens should control the gold reserves (zerohedge).This statement was so strong that Italy's economy minister Tria had to reply by defending the integrity of the central bank. 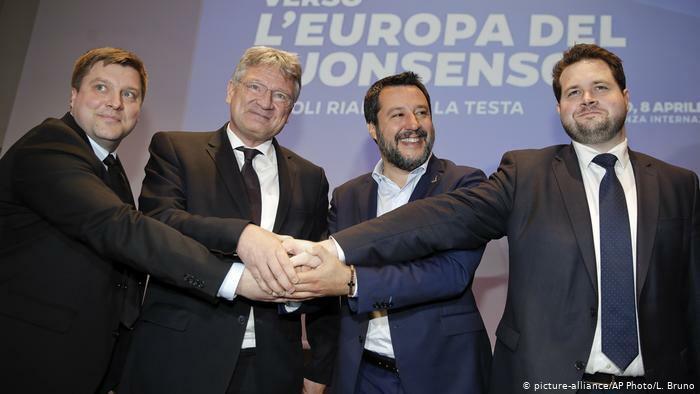 With Salvini being constantly under center for his political views and strong statements, many other far right parties have joined this new wave to the point that now they are building a coalition for the upcoming elections. The far right party from Germany "ADF", which in the past was accused of Nazi like behavior, is gaining more consensus than ever, and is the third most popular party in Germany. They have just joined The League, and other populist parties all over Europe including The National Rally of France's Marine Le Pen and Austria's ruling Freedom Party (FPÖ) to form a coalition for the upcoming election. Many parties in this new coalition share the same strong believes, which include : skepticism towards the EU and the Euro, border security, strong immigration policies. It will be important to see how strong the output will be for this coalition during the European elections. A really positive outcome could tremendously impact the financial markets, and will put heavy pressure on the Euro. The elections will show where Europe is heading in the near future, and how the markets will react to the two possible scenarios. In this long and exhaustive article, I explained my reasoning on why the financial markets could be under heavy pressure in the near future, and why investors are looking closely at what is going on overseas. The European Union is facing many uncertainties :weak economic data, Brexit, and political instability are three of most important aspects that investors are paying attention to. Any negative news coming from Europe could impact the financial markets, and have a negative effect on the global economic growth.